Offering a broad perspective of the philosophy, theory, and aesthetics of early Indian music and musical ideology, this study makes a unique contribution to our knowledge of the ancient foundations of India's musical culture. 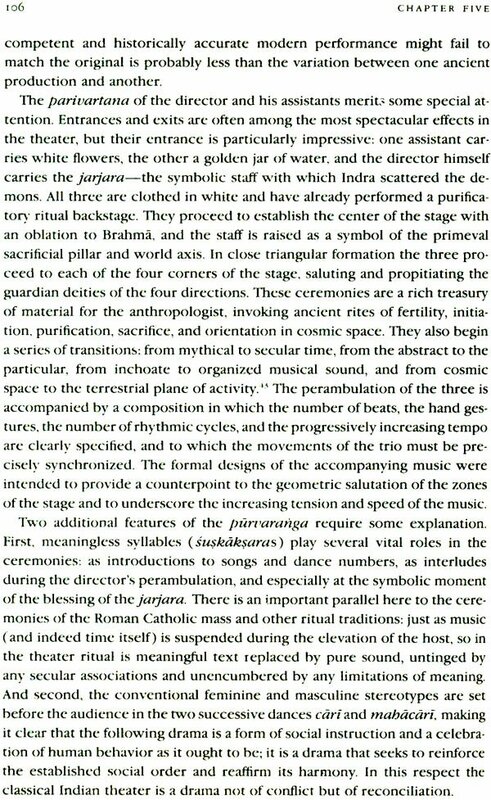 Lewis Rowell reconstructs the turnings, scales, modes, rhythms, gestures, formal patterns, and genres of Indian music from Vedic times to the thirteenth century, presenting not so much a history as thematic analysis and interpretation of Indian's magnificent musical heritage. In Indian culture, music forms an integral part of a broad framework of ideas that includes philosophy, cosmology, religion, literature, and science. Rowell works with the known theoretical treatises and the oral tradition in an effort to place the technical details of musical practice in their full cultural context. Many quotations from the original Sanskrit appear here in English translation for the first time, and the necessary technical information is presented in terms accessible to the nonspecialist. 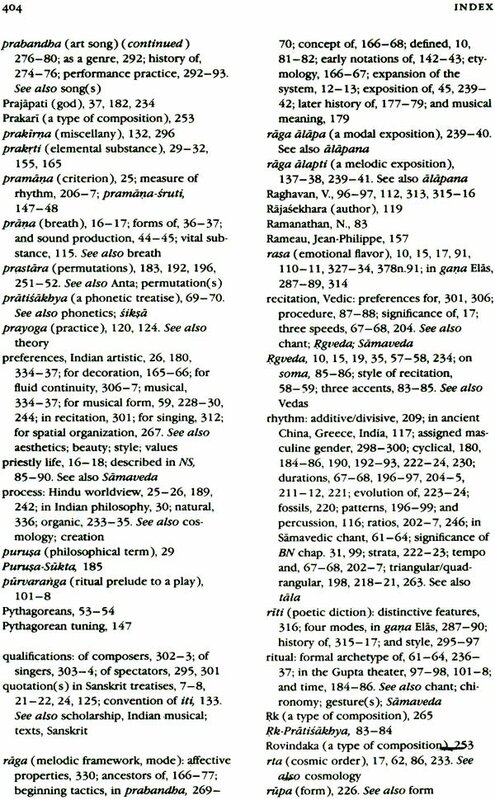 These features, combined with Rowell's glossary of Sanskrit terms and extensive bibliography, make Music and Musical Thought in Early India an excellent introduction for the general reader and an indispensable reference for ethnomusicologists, historical musicologists, music, theorists, and indologists. Lewis Rowel, professor of music theory at Indiana University, has written extensively on Indian music and on the philosophy of music. What was music like in early India? What were its sounds, rhythms, tunes, and forms? How did it differ from today's music, or from music in the an- cient and medieval West? What was it about? What did it mean to those who sang and played it, and to their hearers? I have undertaken this book as an exercise in musical archaeology, with the hope of giving provisional answers to these questions. The aim was not only to pursue a technical investigation of the materials and structures of music but also to increase our awareness and understanding of the intellec- tual foundations of India's ancient musical culture. I shall reserve further ex- planations for chapter 1, but one guiding assumption of this project must be clearly stated here. My study has been motivated by the unshakable convic- tion that the organization of music (by which I mean not only sounds, but also behaviors and concepts) has been continuously informed and molded by the prevailing framework of ideas. Accordingly my purpose has been not only to determine as precisely as possible what we may call the "facts" of music (the tunings, scales, modes, rhythms, gestures, patterns, and formal structures) and the conceptual basis for these facts but also to place these facts and concepts within their proper cultural context and examine their many connections with the fabric of ideas in early Indian philosophy, cos- mology, religion, literature, science, and other relevant bodies of thought. I am particularly gratified that this book appears as a part of the Chicago Series in Ethnomusicology, because I have always thought of it as a study in historical ethnomusicology. Readers will find few references to ethno- musicological theory and method in these pages, but I shall return to make the connections explicit in my final chapter. Any book could have been several different books, and this one is no ex- ception. 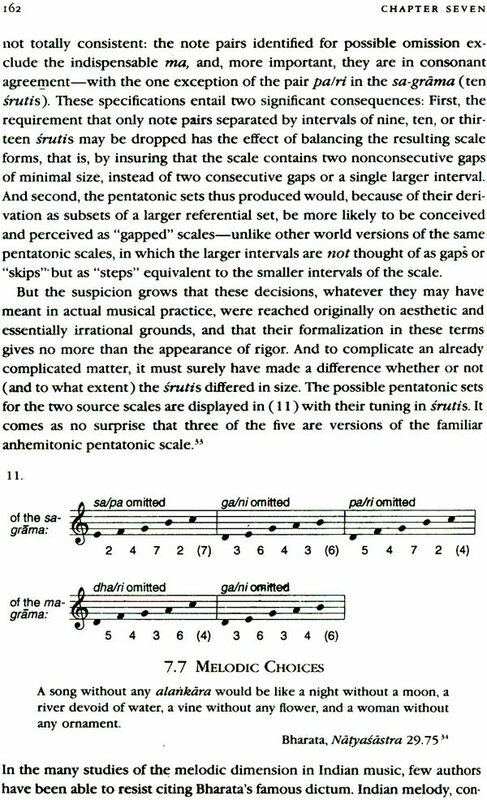 Specialists in ancient Indian music and music theory would wel- come, and perhaps expect, a comprehensive study that proceeds step by step through each of the surviving texts, attempting to resolve every philo- logical question, proposing and defending each of the necessary reconstruc- tions of the many textual gaps and passages mangled in the scribal tradition, explaining each musical concept and tracing its development throughout the corpus of literature, reconciling the many contradictions. and exploring the wider realm of these concepts with far-reaching etymological analyses. Such a book would indeed be welcome. 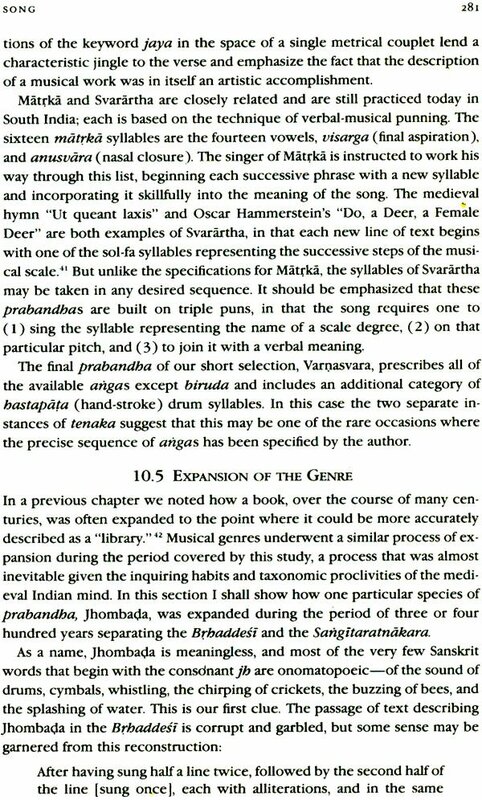 It would also be massive, pon- derous, largely in Sanskrit, quite beyond the reach of most of those who are curious about the early history of Indian music, and, alas, by another author. In short, this is not that book, and I mention all of this to defuse unrealistic expectations. 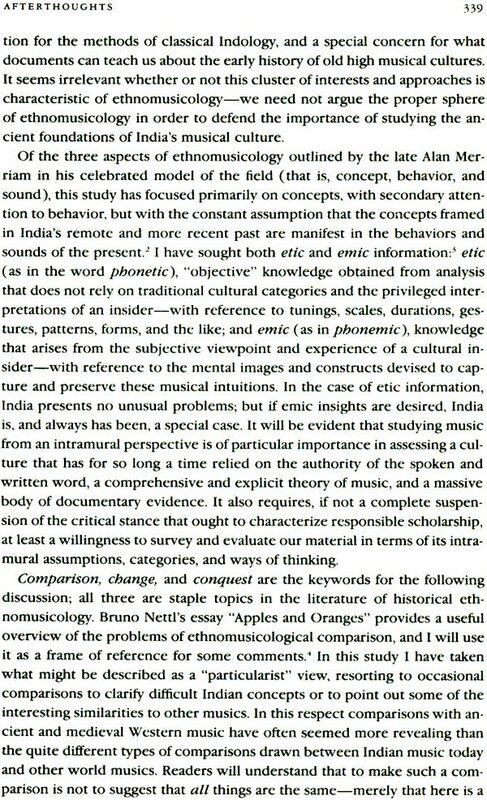 Some of my fellow specialists may also feel uncomfortable with the level of generalization that I permit myself in this study, but I am convinced that much of what we do know about the music of ancient and medieval India remains all but inaccessible as the result of scholarly hesitation to venture any statement whatsoever to which a qualification can be attached. Valid general statements can and should be made, and I count on the intelligence of the reader to recognize that there may be qualifications and exceptions to all such statements.. I have proceeded under the assumption that, despite the intractability of the sources, it is nevertheless possible to assemble an intelligible synthesis of early musical doctrines and the supporting fabric of ideas-a synthesis that will be not only informative but also accessible to various segments of a broad readership: to Western musicians with a lively curiosity but no exper- tise in either Indian music or intellectual history; to ethnomusicologists with expertise in other world cultures as well as a professional interest in the music of India; to specialists in other fields of Indic studies who may wish to learn how Indian music and musical teachings have been influenced by their own body of literature; and most of all, to general readers whose curiosity has been whetted by their own experience with Indian music to- day and who wish to learn more about its background. I hope this study will also be of some value to the handful of Western students of ancient Indian music, not for the general synthesis I present, but for the individual transla- tions, analyses, and points of interpretation along the way. This study has been preceded by a series of technical articles published in various journals during the last fifteen years; for these see the bibliography. This volume differs from the earlier publications in two ways: first, readers will find additional technical material and supporting evidence in the sepa- rate articles, and I have provided citations to point the way. In this volume I have confined the technical material to concise illustrations of the principal point (s) under discussion, and I have been highly selective in choosing pas- sages for translation and musical issues for illustration. In no case has any unrevised material been transferred to this study. And second, I have ven- tured much farther here in matters of interpretation and analysis of the cul- tural background than was possible in a series of articles on individual topics. Above all, I have attempted here to present the subject as a whole, not in compartments. Readers should expect to encounter many Sanskrit words, but in virtually every case they appear in the form of single terms, in transliteration, and have been provided with either a translation or an explanation. 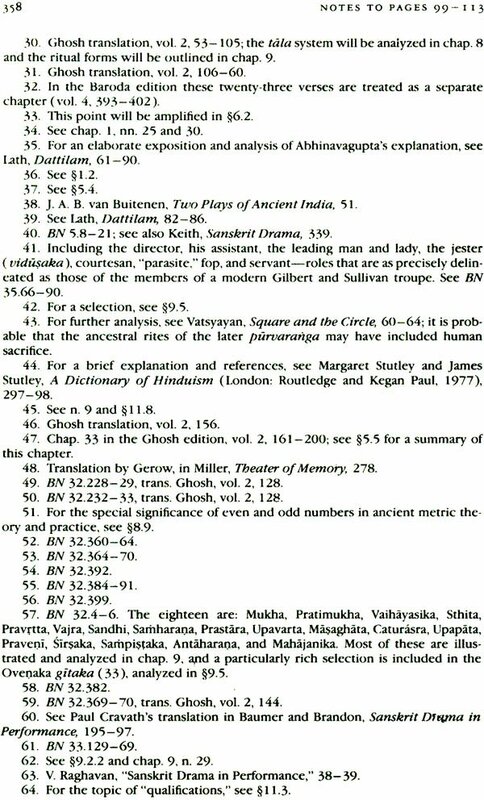 A glossary of Sanskrit terms has also been provided for quick reference. 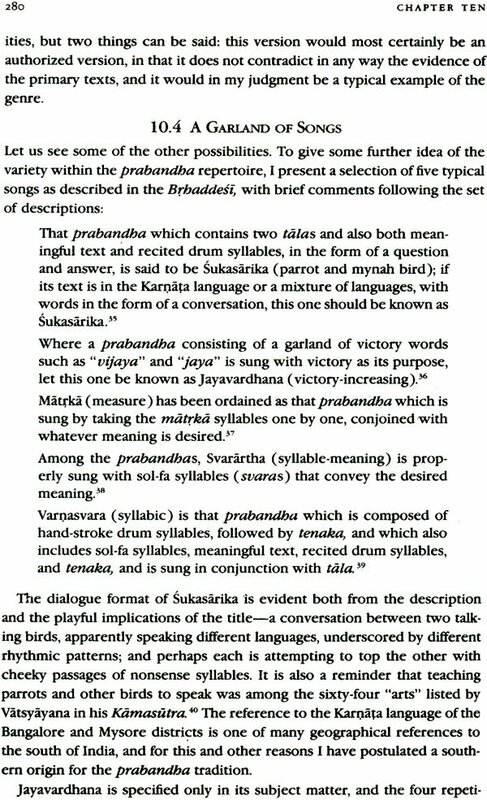 The book includes a large number of English translations from the major Sanskrit treatises on music, and I have selected a wide range of translation styles- from the painstakingly literal to the happily periphrastic. My own transla- tions, of which there are many, fall somewhere in between. 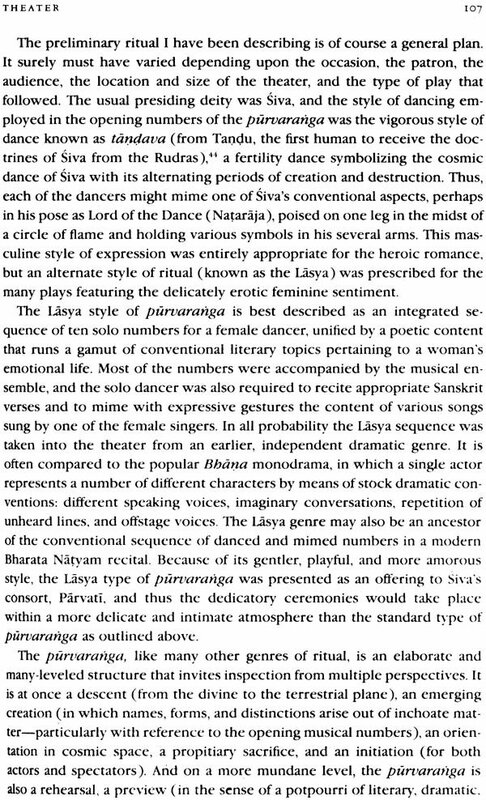 It has seemed better to me to give some indication of the breadth and diversity of Indian musical scholarship than to take advantage of the translator's prerogative to channel his subject into his own lexicon and style. Scholarship does not stand still when we are working on a project, and I should like to have seen the fruits of several current works in progress, in- cluding D. R. Widdess's study of the ragas of early Indian music, the second edition of Mukund Lath's Study of Dattilam, R. Satyanarayana's translation of Parsvadeva's Sangitasamayasara, and Prem Lata Sharma's translation and critical study of Matanga's Brbaddesi. Tentative publication information has been included in the notes and bibliography. I have found this project a musical and intellectual adventure, and I invite readers to share it with me. Let us begin with the five keywords of my title. By India I mean the entire subcontinent of South Asia, including Pakistan and Bangladesh, before parti- tion. By "early" I mean as early as possible, including the historical eras often identified as "ancient" and "medieval," with the middle of the thir- teenth century as a convenient terminus ad quem. 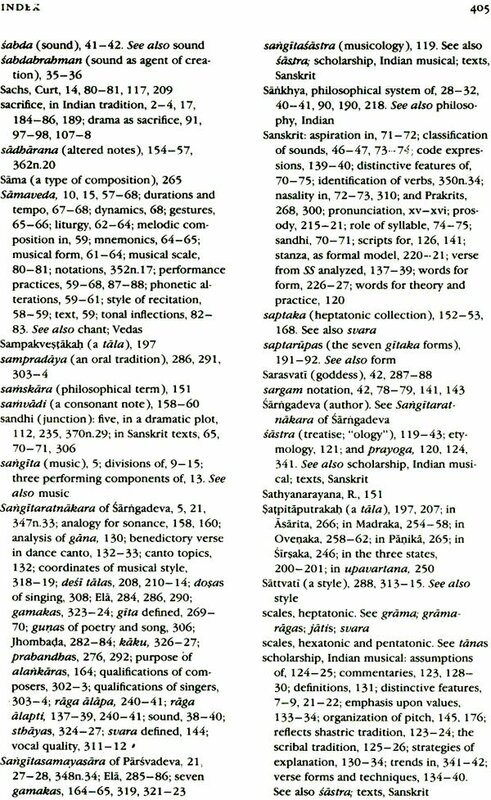 I shall have frequent oc- casion to refer to an important musical document from that century-the Sangitaratnakara (The mine of musical jewels) of Sarngadeva, a monu- mental synthesis of the many musical doctrines expounded by the authors of the previous millennium. My account thus ends before the successive waves of Persian culture made their full impact on the music of northern India and thereby encouraged the development of separate musical tradi- tions in the North and South. I shall suggest some early evidence for this separation, but it is not among my main themes. Similarly, I shall point out many of the roots of modern Indian musical concepts and practices, but the main emphasis must remain on what Indian music was (insofar as that can be determined), not what it now is. By "music" and "musical" I mean not only the phenomena that we or- dinarily regard as music in the West but also the entire structure of ideas surrounding and informing the practice of music. When we recall that the ancient Greek concept of mousike was held to encompass all of the do- mains of the nine Muses-from poetry, song, and dance, to history and even astronomy-we should be prepared to encounter a complex structure of ideas with multiple dimensions and many interconnections. The standard Sanskrit word for music is sangita-the exact equivalent of the Latin con- centus. The most precise, if not the most elegant, translation is "concerted song." Our investigation, however, must extend to genres that would not ordinarily be considered to be a part of the realm of gita (song). These in- clude not only the various traditions and styles of sacred chant but also composite genres, especially the theater, in which what we call "music" is an integral part of a composite artform, and within which it is not always possible to separate what is music from what is not. 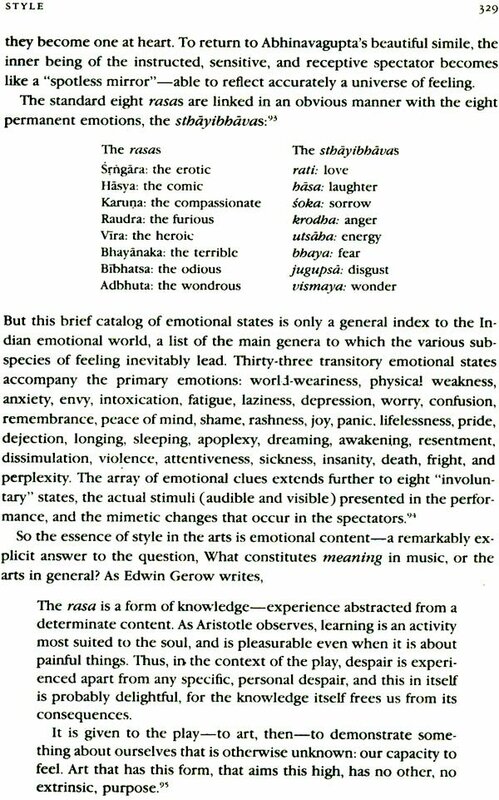 But the word gita pro- vides the semantic core of the idea of music and conveys the quintessential humanism of the ancient Indian concept: musical sound is, first of all, vocal sound. The most powerful and generally accepted ontological conception of music is rooted in a profound cultural metaphor, in which the emanation of vocal sound from deep within the human body has been linked with the process of creation as a "bringing forth" of the divine substance that lies at the heart of our innermost being. By musical thought I mean the complete ideology of music-including, but not limited to, those technical compartments within which music has been organized into notes, scales, rhythms, forms, and the like, and extend- ing to larger philosophical questions of being, knowledge, and value. I shall outline traditional Indian answers to such questions as, What is musical sound? What does it mean? How is music transmitted? and What cultural values does music represent? 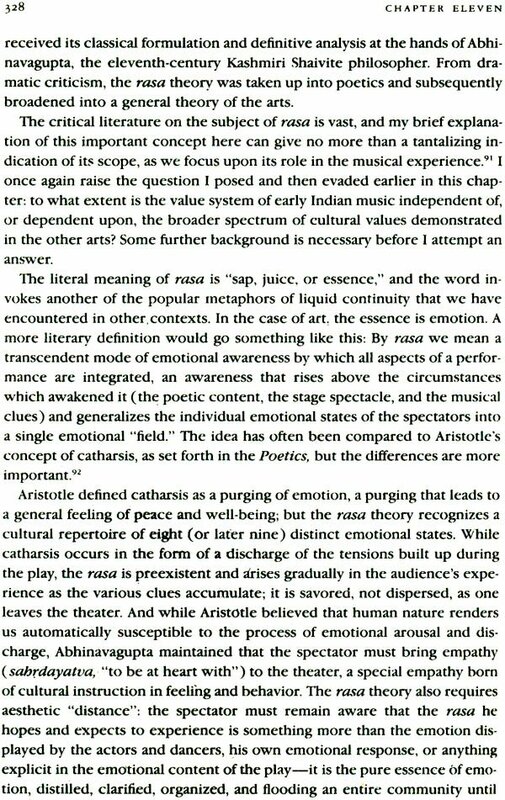 The separate chapters will help to channel these questions into a systematic organization, but at the same time they conceal the essential relatedness of all Indian musical thought. 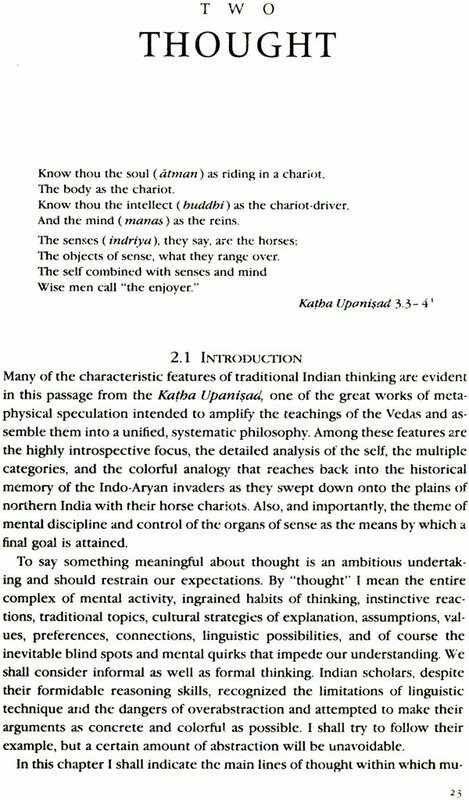 A few preliminary observations on the distinctive patterns of Indian thought will set the stage for the more detailed discussions in chapter 2. Readers familiar with the surgical dichotomies of ancient Western thinking, in which the search for truth proceeds by separating everything that a thing is from everything that it is not; and eventually penetrating to the core of a concept when no further divisions are possible, will encounter different habits of thought. 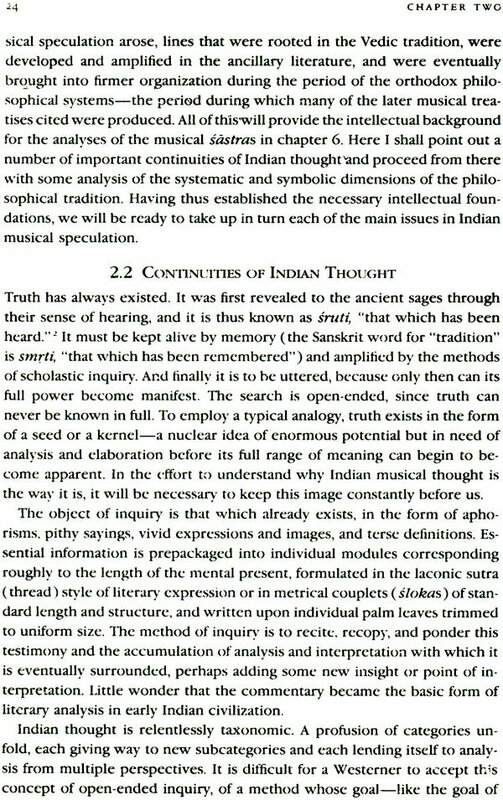 Inquiry is open-ended in the Indian tradition, and the pro- cess of making categories is infinite-at least in theory. Every statement that can be made blurs a finer distinction, and ultimate truth or reality lies be- yond the reach of human experience or inference-except perhaps in those moments of suprasensible illumination vouchsafed to the yogin. 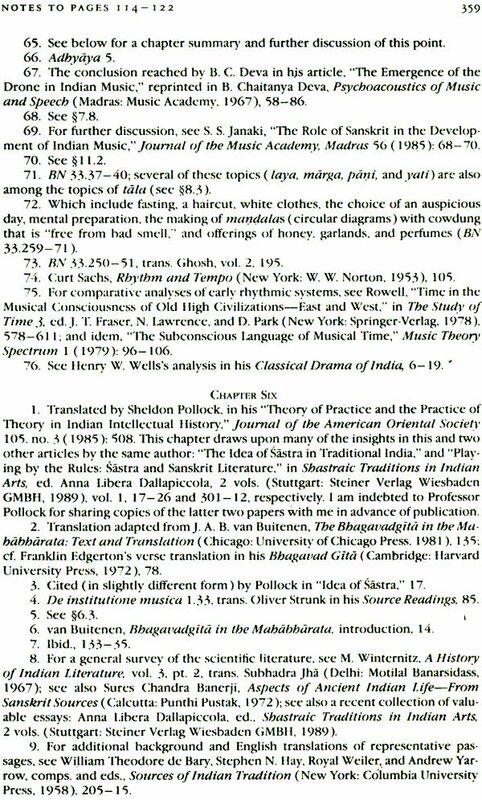 Indian mu- sical thought has thus been channeled into elaborate taxonomic structures within which subcategories unfold in profusion, subcategories that often are not mutually exclusive and which thereby encourage a certain amount of ambiguity Truth is revealed, not achieved. It is manifested by authoritative teachings and carried forward by a tradition of literary scholarship. Knowledge of it is always imperfect. Within such a framework of belief, the literature of music has taken on a prescriptive tone, and musical doctrines require no other jus- tification than their prior existence in an authoritative treatise. If apparent contradictions appear, they are the result of our limited knowledge or of accidents of the transmission process. They are to be understood, not dis- carded and replaced by new teachings. Such is the reasoning behind the Indian commentarial tradition and the continuous probing for meaning in imperfectly preserved texts. Musical writings have taken on a life of their own as a result of the many scribal copyings and recopyings over the centuries. 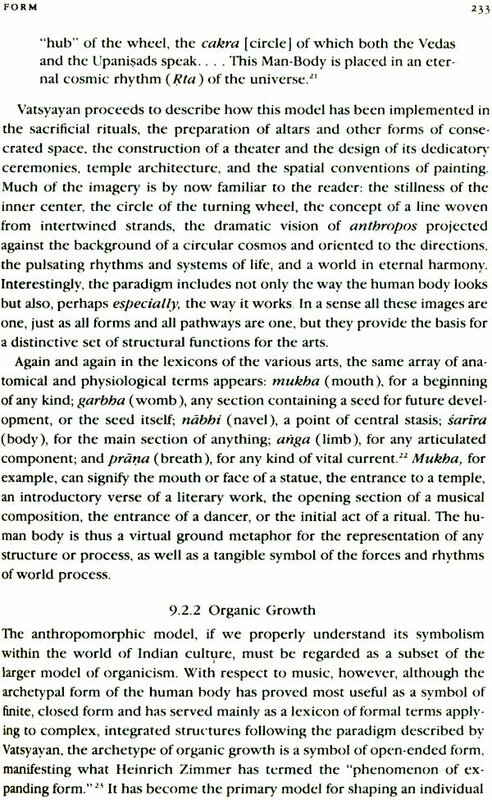 It is not fanciful to re- gard these texts as living organisms-organisms manifesting the typically Indian play of images and plurality of forms that mask the underlying unity. Indian musical scholarship has also been likened to the course of a mighty river ( one of the cherished analogies of Indian thought), accepting tributary streams, turning away from dry channels, and mingling separate waters in a central confluence of ideas-c-disciplining and accepting certain contribu- tions while rejecting others outright. The analogy has no doubt been over- worked, and this centrist imagery can cause us to overlook or undervalue the revitalizing force of new musical contributions, as in the movement re- ferred to as desi-an infusion of various provincial musical traditions be- tween ca. A.D. 500 and 1000, an infusion which greatly expanded the boundaries of the ancient musical system and altered the future course of Indian music in far-reaching ways. Whatever the imperfections of the concept, I shall present the outlines of such a central tradition as documented in Indian literature from late Vedic times to the thirteenth century, a tradition that proved flexible enough to accommodate the mystical doctrines of Tantra (as in Matanga's Brbaddesi) and the elaborate transcendental philosophy of Kashmir Shaivism (as ex- pounded by the commentator Abhinavagupta). I Most of the evidence is from literature, oral as well as written: unlike European music, for which systems of musical notation have existed for more than three thousand years, the music of India has never been recorded in more than a skeletal script. Music, like other branches of learning, is not something to be ac- quired by reading books or studying scores; it is learned from a master teacher, a guru. The sole purpose of a notation is to remind us of what we have already learned. Paradoxically, this reliance upon a tradition of oral in- struction has narrowed the boundaries within which innovation is accept- able. 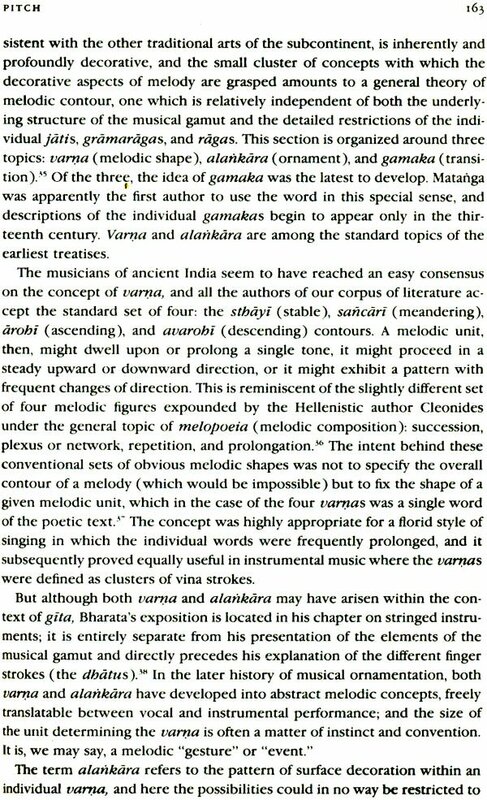 While there is still much to be learned from reconstructing the notations in early musical texts, it must be accepted that knowledge of what the music of early India was like must rest on two sources-the textual evi- dence and Indian music as it is heard today. From Vedic times to the thirteenth century is indeed a long time, and cer- tain historical problems must be acknowledged: with the aid of hostile na- ture and historical accident, Indian scholarship has managed to cover its tracks so. successfully that the step-by-step development of music and musi- cal ideas can be perceived only as recorded in the few scattered monuments of musical literature that have survived. And each such document as it has come down to us is itself a tangle of various historical layers -and a mixture of quotations, glosses, and commentary in which the precise sequence of contributions is often impossible to determine. As Prem Lata Sharma has ob- served, "history' in the context of Indian culture has to be viewed as a com- plex phenomenon comprised of concurrences and overlappings rather than a simple linear phenomenon." Students of early Indian intellectual history have learned to accept the price that has to be paid for this inescapable lack of "simple linearity." What it means for the present study is that the advance of musical ideology must often be presented in an admittedly discontinuous format, in the form of successive snapshots instead of the more accurate form of a series of motion picture frames in extremely slow motion. or to change the metaphor, I shall have to argue across the gaps in the fossil record and run the risk that the resulting narrative may appear more discontinuous than it in fact was. 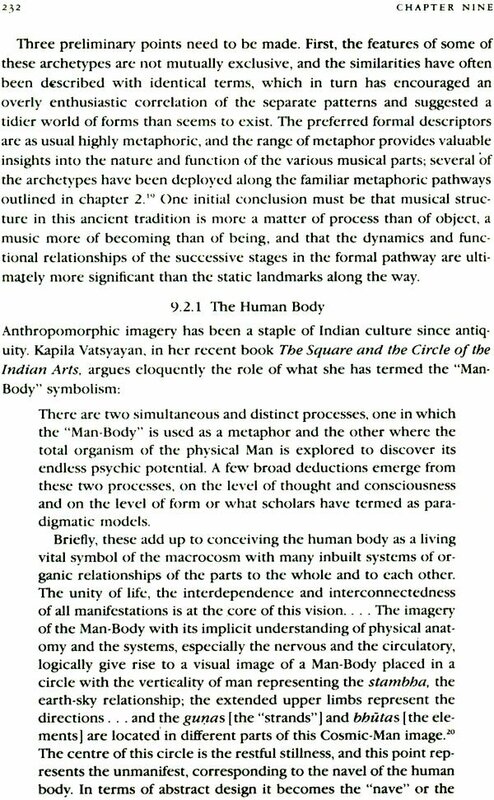 I shall, for example, attempt to trace the evolution of the Indian idea of musical sound-from early metaphoric concepts and primitive acoustical speculations to the refined arguments and subtle distinctions of the later philosophical schools-but the approach must be to present the various manifestations and clarifications of a single, complex idea, as assembled from the available evidence (sketchy as it at times may be). The general plan of the hook is first, to establish the appropriate contexts for music and musical thought-intellectual, cultural, and social-and sec- ond, to focus in turn on each of the main technical compartments of music. The chapters will therefore be thematic rather than chronological; each chapter will be a substantial strand in the fabric of musical ideas: thought, sound, chant, theater, pitch, time, form, song, and style. Each of the main strands of ideas will be unraveled into as many component strands as pos- sible, and I shall try to show their relatedness. Although treatises are the main source of evidence, I shall not emphasize the many philological prob- lems that continue to block our full understanding of this corpus of ancient literature. I shall present summaries and interpretations of the major musi- cal texts and also translations of many representative passages so that the special flavor of the literature will be conveyed along with its substance. Where appropriate, I shall draw comparisons to the musical systems and thinking of the ancient West, so that the distinctive character of Indian mu- sical thought will shine the more vividly. The central premise of this study is that music and musical thought de- pend upon their cultural context and can be fully understood only with ref- erence to that context. This is true with respect to other world musics, but it carries special meaning in the case of India, where a unique cultural tradi- tion of great antiquity and literacy has given birth to a remarkable musical language. 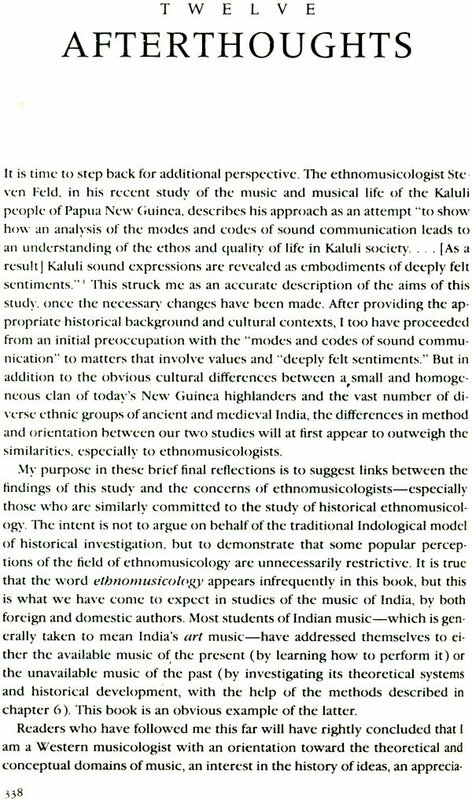 The aim of my study, then, is to explore in a systematic way the philosophy, theory, and aesthetics of early Indian music, with constant refer- ence to the cultural contexts within which the idea of music arose and by which it was given distinctive form and flavor. In a typical Sanskrit treatise or a chapter thereof, this would be the appropri- ate location for an uddesa-a list of the principal topics to be expounded. My uddesa is displayed in the form of a schematic diagram ( 1). The intent is to give some preliminary idea of the range of the ancient Indian concept of music and its many traditional connections with the other performing arts. I will introduce a number of important terms to be encountered in subse- quent chapters, although sharper definitions and fuller explanations will fol-: low in due course. The diagram ( 1) should be read with the understanding that it constitutes a unified semantic field within which the connecting lines do not represent exclusive pathways between the separate components. "Music," the hypo- thetical center of the field, is at the same time only a limb of certain larger artistic composites such as drama and dance. So it is helpful to regard the diagram as a flexible and multidimensional array with reversible pathways and numerous unshown interconnections. No particular priorities should be inferred from the arrangement of the diagram; I shall simply take up each of the divisions in turn. The diagram will also serve as a typical model of Indian classificatory schemes, which are more like networks than pyramids because of the many interconnections. In the various technical compart- ments (especially pitch and rhythm), it should be understood that each of the basic divisions opens out into an array of subtopics.